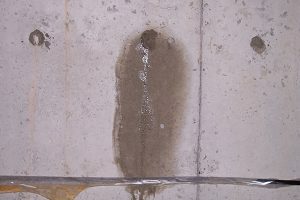 Are your foundation walls constructed of poured concrete? 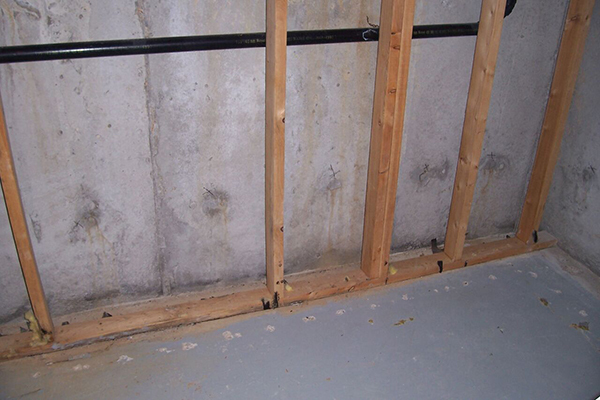 Do you have signs of a leaking Basement Foundation Crack or tie-rod holes in your unfinished basement? Are there cracks in the basement walls you are planning to finish or renovate? Is there a condition of sale on your home that requires foundation cracks to be repaired? 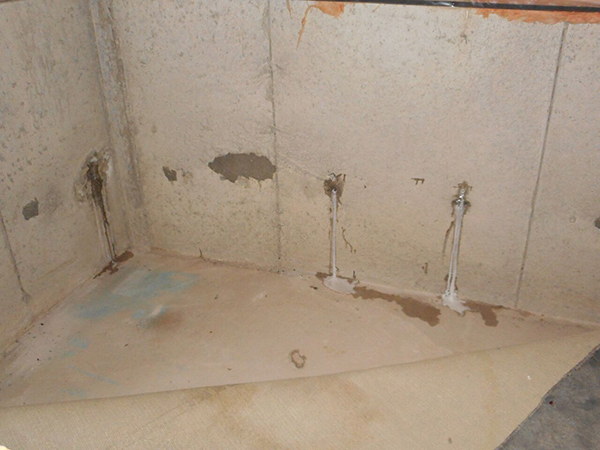 If you answered yes to any of those questions, then you are in need of the services and solutions offered by PCS Basement Waterproofing Specialists. 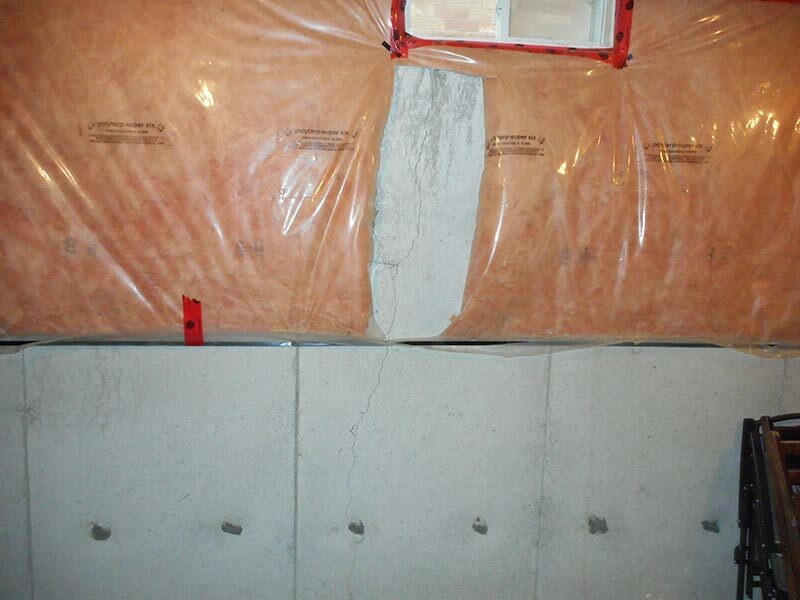 Foundation cracks can start to develop as soon as after the foundation walls have been poured and backfilled. As water from rain or snow melt makes its way down the foundation walls and accumulates, hydrostatic pressure is created which causes the foundation to crack. In Canada we experience four seasonal changes, spring, summer, fall and winter which also puts varying amounts of stress on the foundation walls as the temperatures and weather patterns change often or suddenly. Another contributing factor with homes today is poor or shoddy construction due to the speed in which they are built. The main cause however, of most cracks developing in a foundation wall is from the freeze and thaw cycles that occur during the winter and spring seasons. With continued changes in our environment and unusual weather occurrences at certain times of year, this problem has become more and more common over the years. With the winters we experience today when temperatures can change rapidly from one day/week to the next, the foundation now goes through multiple freeze and thaw cycles which increases the chances of foundations cracking and eventually leaking. Not so long ago, the ground became frozen in November or December and stayed that way until the winter season was over before thawing began in the spring. Today the ground can freeze then thaw during a sudden warm period and then freeze again when temperatures drop back down, multiple times over one winter season instead of just once. 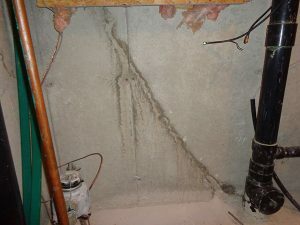 Most basement foundation cracks start out as visible hairline fractures in the foundation wall, but over time with ongoing expansion and contraction from extreme weather changes and freeze/thaw cycles, the crack gets wider until eventually water leaks into the basement. 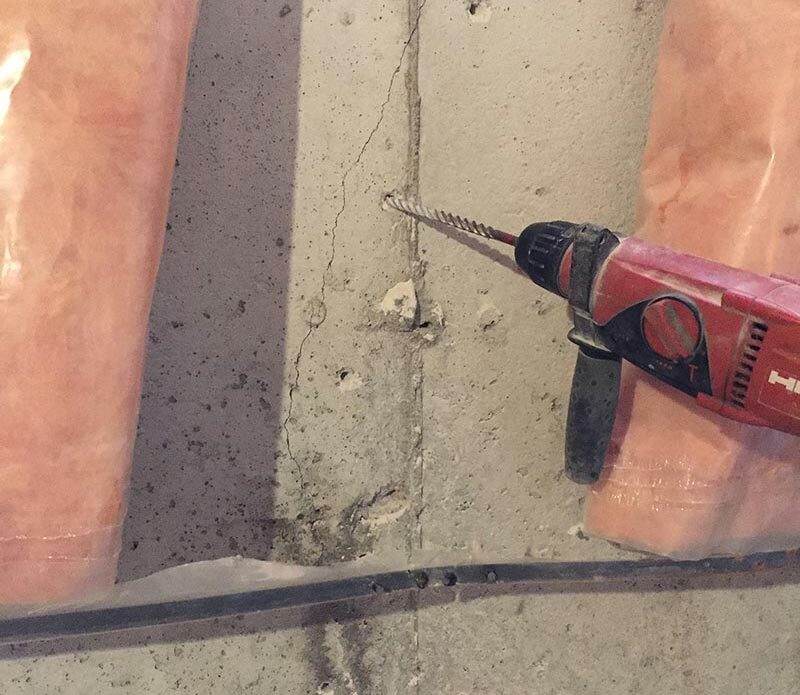 Cracks in poured concrete foundation walls start from the top and front (exterior side) of a foundation wall and work their way down and through to the back side (interior side) where they become visible on your basement walls. 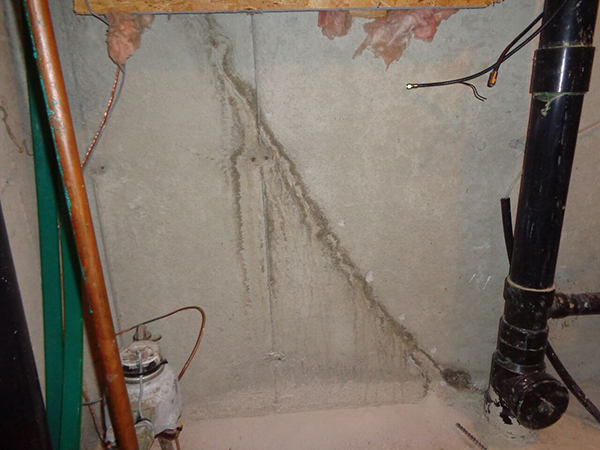 Most cracks in the foundation will develop within the first five to seven years after the home has been constructed and for that reason we recommend homeowners not finish their basements within that time period. 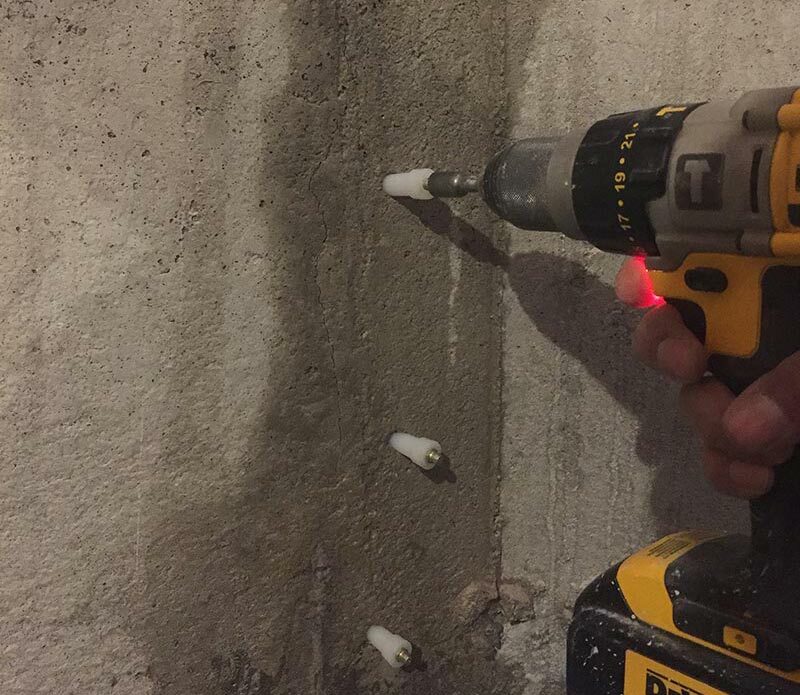 That being said, if you do want to finish your basement sooner than later, then we recommend you contact PCS Basement Waterproofing Specialists and have us come out and inspect your unfinished basement. If you are planning to finish your basement whether your home is newly constructed or not, then the most proactive approach you can take to protect yourself against possible future basement leaks and foundation repairs, is to schedule a Pre-basement Finishing Inspection with PCS. Tie-rods are metal rods that are inserted and bolted to either side of the wood forms used to construct basement walls of concrete. They keep the forms in place so that concrete can be poured in between. Once the concrete has had time to dry, the wood forms and tie-rods are removed where possible, or cut and the holes left behind are patched with hydraulic cement. 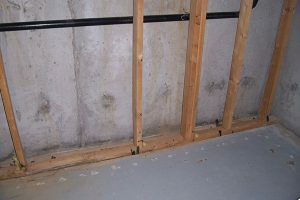 These patches are easily seen on the inside walls of an unfinished basement, are usually in line vertically with one another and spaced approximately two feet apart (which is approximate width of a standard wood form). If the home you ownhas partial or full insulation on the basement walls, then a leaky tie-rod hole may not be visible until the insulation is cut and the area in behind inspected. If you do notice water pooling on the basement floor after a rainfall or snow melting and can’t see a crack below the insulation strapping, then chances are you have a leaking tie-rod hole. 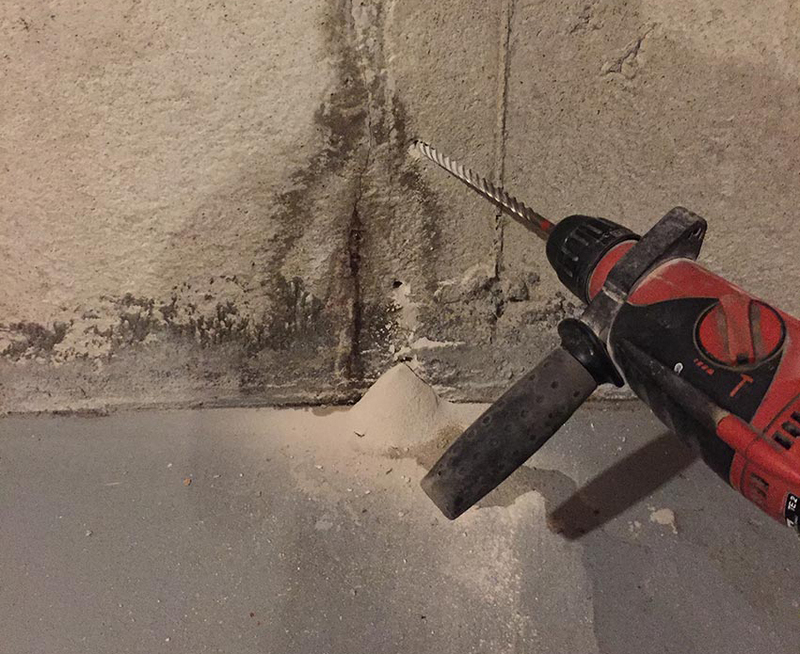 We use only the most technologically advanced material to seal your leaking foundation cracks and tie-rod holes. 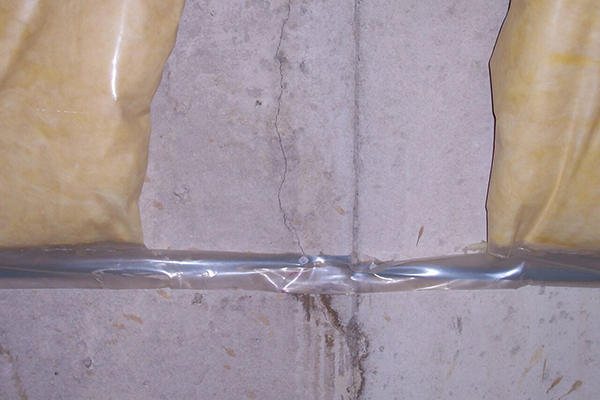 Our repair is not a “Band-Aid”, but a permanent solution to your leaking foundation cracks and tie-rod holes. 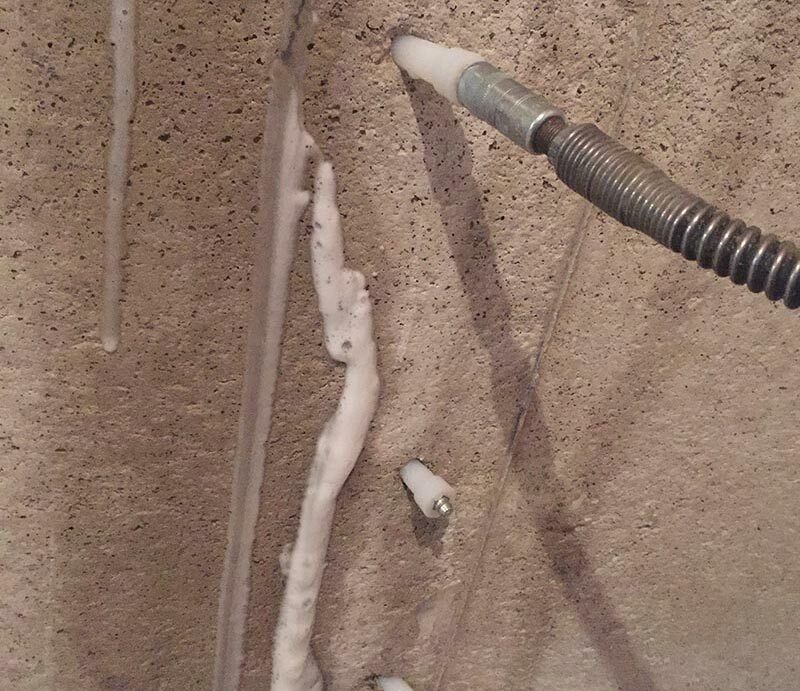 The water activated Polyurethane Resin we use was designed for sealing leaks from foundation cracks, tie-rod holes, and expansion and control joints in concrete structures. 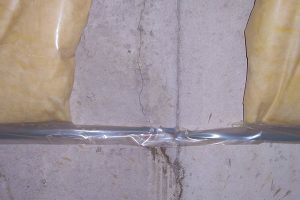 The Polyurethane Resin is mixed with an accelerator solution which reacts when it comes in contact with water, expanding and curing ten times its original volume, forming a micro-cellular closed cell gasket with excellent adhesion and long-term flexibility to withstand the expansion and contraction foundation cracks and tie rod holes are subjected to. The cured compression gasket that is formed in the crack and tie-rod hole after injection, remains stable, flexible and is highly resistant to degradation resulting from repeated freeze/thaw and wet/dry cycles which are common with season changes and our overall climate. The Polyurethane Resin is non-toxic, odorless and environmentally friendly. Q: Is it better to do the repair from inside or outside? A: Some contractors may try to tell you that it is better or imperative to do the repair from the outside, however that is not necessarily true. The injections or repairs that PCS performs from the inside or outside, are sustainable and come with the same lifetime transferable warranty. The biggest difference with exterior repairs is they take longer and cost more simply because of the amount of time and work involved in carrying out the repair. There can also be weather related issues or utility locates that may delay the start or completion of work. Q: What if I have a finished basement? 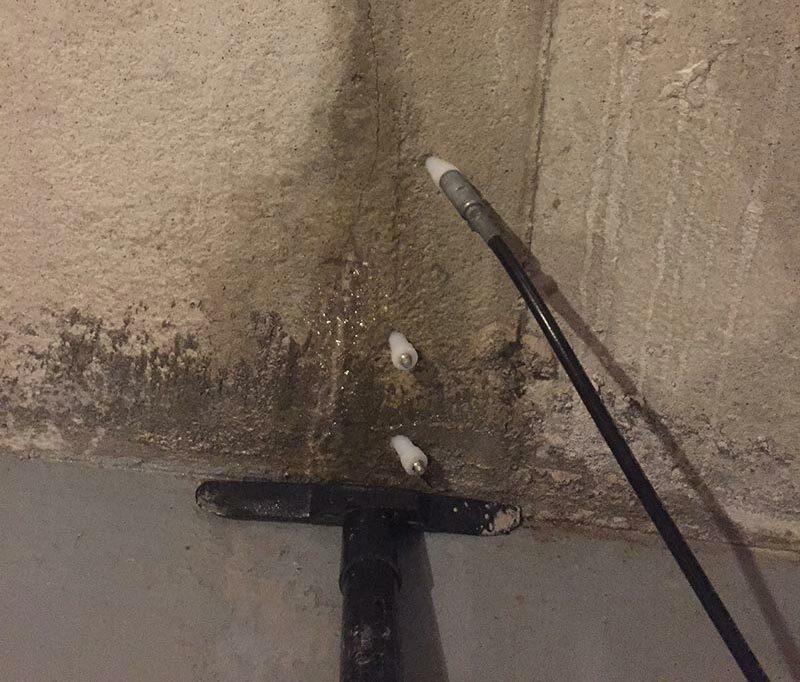 A: Although we usually recommend injecting foundation cracks from the inside in finished basements so PCS can also check for and uncover any possible mold issues in behind baseboards, drywall, panelling, etc., our injections or repairs can also be done from the outside. 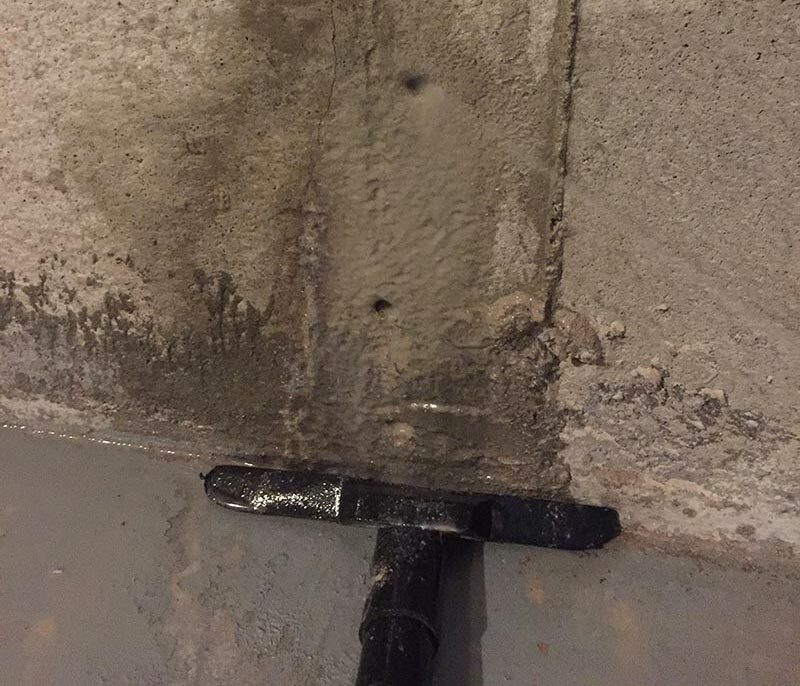 Q: How do I know if I have more than one foundation crack or leaking tie-rod in my finished basement? Because foundation cracks start at the top of the foundation wall or “sill plate”, as long as this is visible on the outside of the home and not obstructed by anything or buried below grade, you will be able to identify any additional cracks around your foundation. The same however cannot be said for tie-rod holes since they are all located below grade and only visible from the inside. 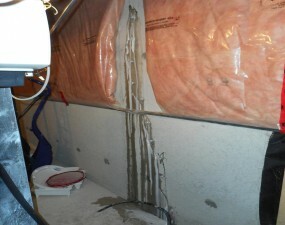 Q: How long does the average crack repair take? A: On average it takes approximately one and a half to two hours to inject a standard size crack (5-6 feet in length) from the inside in an unfinished basement and slightly longer if the leak is located behind a finished area. An exterior repair can take up to a day to complete depending on type of soil, digging depth, ground conditions and location. 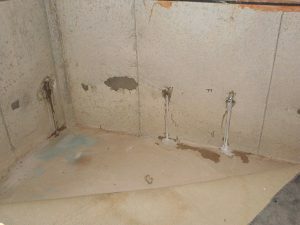 Q: Can these type of repairs be done all year-round? A: Yes interior injections can be done all year-round, however exterior injections or repairs can only be done during the spring, summer and fall seasons when the ground is not frozen and weather conditions are appropriate.